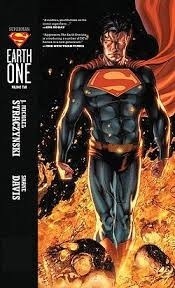 Just finished reading this amazing graphic novel written by J. Michael Straczynski and drawn by Shane Davis. This book takes a very introspective look at the man of steel and changes up the established myth in a similar way as the new film. This along with Vol.1 take on superman during his earliest outings as the big blue boyscout and shows us a Clark/Superman still unsure of himself and a world that has no ideas if they can or should trust him. With a few minor tweaks for continuity purposes I don’t see why they don’t just use this as the template for the sequal. A great read that takes the spirit of the classic character and brings him into humanistic sci-fi world, this version introduces a wicked take on classic villain Parasite, and even shows us a very interesting new version of arch-nemesis Lex Luthor. Or should I say Lex-squared. Read it and you will get it. This entry was posted in comic books and tagged dc comics, graphic novels, Superman. Bookmark the permalink. ← Your grand-daddy’s Superman this is not.